Every day, more and more customers are making purchases from e-commerce websites. In fact, the global online market is expected to grow significantly over the next few years, reaching nearly $4.9 billion by 2021. When you are working to expand to global markets, you need to approach the SEO aspect on a local level. Regardless of how big or small, your operation is, localization is critical for website visibility. This process involves everything from using location-specific keywords, understanding how the search engines work in different areas, and how certain demographics navigate the web. If you’ve got a business idea that involves selling products online, there are a number of big advantages; you are not restricted by location, time zone, regular business hours, etc. However, the ability to sell to people across the globe certainly has its fair share of challenges. Most importantly, making sure the website is visible in online searches requires several critical tweaks for international users. If your website is going to attract customers in different countries, one of the first things you will need to do is adjust the URL structure for e-commerce SEO purposes. Since search engines are always trying to offer the most relevant results to a query, they are not likely to pick your domain first if it is not optimized for that customer. This is why your site must be structured for local SEO in your targeted countries. Your website’s URL structure is one of the clearest ways to send signals to search engines for a higher ranking. There are three main options for e-commerce URL structures, all of which come with their list of pros and cons. Let’s discuss. A Country Code Top-Level Domain (ccTLD) is what shows users and search engines the country of origin that a website is targeting. This is the two or three letter code at the end of the website. In the United States, the ccTLD is “.com” whereas in the UK it is “.uk”, France is “.fr”, and China is “.cn”. Most search engines will automatically input the correct ccTLD based on the user’s location, but this can be manually entered as well. For example, if you type in www.amazon.com, you will be automatically routed to the American version of the website. However, if you put in www.amazon.mx, you will be taken to the website that is optimized for Mexico. A ccTLD is the single best way to signal a targeted location to Google because it treats this URL as an individual site that is locally optimized. However, the downside is that it does not signal the website’s language. Say that your company is trying to target customers in Korea – so your website’s ccTLD ends in “.kr”. Customers who speak Chinese but live in Korea may find your website thanks to this local SEO strategy, but it is not relevant to them because of the language difference. Another downside to using a ccTLD structure is that it is quite expensive and time-consuming. Essentially, you will need to create separate websites for each targeted region, which could cost you up to $1,000 per domain, in addition to the cost of design and maintenance. This approach would work best for an e-commerce company that wants to establish their brand as separate entities in global markets. The ccTLD structure means that each global version of your website will have its own set of keywords and domain authority that is not influenced by your other sites. This is great for businesses that will have dedicated teams for each targeted country and have the resources to keep up with website demands, but not really a feasible option for smaller organizations. Using a subdomain allows you to add third-level domains for language or location options. The country or language subdomain is placed before the gTLD of the website to signal to search engines what group that website is targeting. Generally, a customer will arrive at your home site and be able to choose the language or the location option and then be directed to the correct subdomain. They can also be directed to your site automatically through location signals or from a search engine result. This is great for micro-targeting your audiences and it is fairly easy to set up within your website’s original domain. It is also easier and cheaper to set up than a ccTLD. You can easily delegate subdomains of your main web domain through Resellerclub’s DNS Service. This allows your business to target better based on your customer’s location and optimize their experience for specific programs. Subdomains are commonly used by e-commerce companies to separate the “sections” of their websites, such as their blog pages and product pages. Talk the SaaS company WalkMe as an example. Walkme.com is their main website domain, and their blog is a subdomain. One of the downsides to using a subdomain is that it does not guarantee that your domain authority will automatically transfer. A subdomain does not receive the same level of link equity as the main domain of the website, so your team will essentially have to start at square one in terms of SEO for that site. There are a lot of cons to the subdomain option in terms of SEO, making it one of the least popular choices for URL structures. However, it should be noted that subdomains allow businesses to operate these separate sections of their site on different servers. If you need to use a CDN for faster global loading speeds or are running global versions on your site on international servers, this is a good option. If you think of your website as a filing cabinet, a subdirectory would be a folder within that site. These are displayed to the right of the domain with a forward slash separating the two. 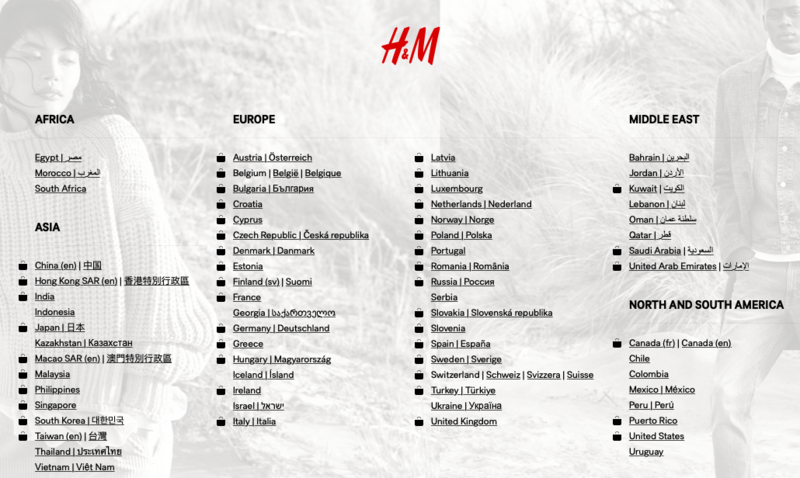 H&M’s website uses this option that allows customers to choose their country and language preference if they are not automatically taken to the correct subdirectory. Say you are an English-speaking Canadian customer. Once you click that option, you are redirected to the “hm.com/en_ca” subdirectory. Subdirectories do inherit the domain authority of the main hosting site, which is a huge bonus for e-commerce companies that are ranking highly in their original market. It is also quite easy to set up since it is connected to the main host. The downside to subdirectories is that it limits your site to a single server location, which could negatively impact your global UX and cause your site to load slowly in other countries. You will also need to do thorough research on the vernacular and search engine behaviour of your targeted customers. Customers may not understand what the subdirectory is leading them to if the code is not clear, which could hurt your click-through rates. All in all, using a subdirectory is a good option if you are able to keep your website host unified without compromising on international UX. For instance, if you are located in the US but want to expand to reach customers in Canada and Mexico, adding subdirectories for these customers would be an easy option since they are not too far from the hosting server. Expanding your online store to reach growing global audiences is a great opportunity. However, it’s not necessarily easy. There is a lot that goes into global expansion, like figuring out logistics, currency calculations, global marketing strategies, and language differences. But one of the most important steps an e-commerce company will need to take for expansion is ensuring that their website is optimized for global success. The process of earning good rankings on the SERPs encompasses everything from choosing the right hosting platform, optimizing for action-driven keywords, getting high-quality links, and much, much more. Each structure option comes with its pluses and minuses, and some offer unique benefits to specific situations. Before you start global expansion, be sure that you understand the details of these options and pick the one that best supports your goals.